A couple of years ago, Bogart and the great look of the Kindness Bus attracted a wonderful couple to engage me in conversation. There was an instant friendship forged. Bill, Wynn, Champy and Rocky in today’s photo have become some of our greatest supporters. I am truly grateful to them!! 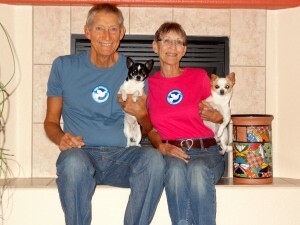 They look great in their One Million Acts of Kindness gear as well. Wynn posted about us on her Facebook page something so nice, I just have to share it with everyone. We are thankful today for a chance meeting in a Kansas Walmart parking lot with Bob Votruba founder of One Million Acts of Kindness and the Kindness Bus. He touched our hearts and changed our lives. This entry was posted on Friday, January 17th, 2014 at 3:47 pm	and is filed under Kindness. You can follow any responses to this entry through the RSS 2.0 feed. You can leave a response, or trackback from your own site.